Alternate Spellings of Surname: McCabe, McCafe, McCape. Born in Ireland on 4 March 1842, Sylvester McCape was just ten years old when he emigrated to America with his parents. As he grew from boy to teen to young adult, he took up the trade of shoe repair, ultimately becoming known as a trusted cobbler to the residents of Allentown, Lehigh County, Pennsylvania. Following the fall of Fort Sumter to Confederate forces in mid-April 1861, Sylvester McCape also became one of the earliest responders to President Abraham Lincoln’s call for troops to defend the nation’s capital. Enlisting with the 9th Regiment, Pennsylvania Volunteer Infantry in April 1861, he was among those who marched off as part of the first three companies from the Lehigh Valley to turn out for duty. On 4 May, the 9th Pennsylvanians were transported by rail to West Chester, Pennsylvania. Arriving around 9 p.m. in the midst of a blizzard, they were stationed at the courthouse until their camp site was available. Relocated to Camp Wayne near West Chester, they then pitched their tents and began regular drilling. They were followed by the 11th Pennsylvania Volunteers, a number of whom would join with the 9th Pennsylvanians in enlisting later that same year for three-year tours of duty with a different regiment – the 47th Pennsylvania Volunteers. On 26 May, the 9th Pennsylvanians were transported by rail to Philadelphia en route to Wilmington, Delaware. Their assignment was to boost morale of those residents of the region who were loyal to the Union while “keeping the lid on” the actions of any citizens who might be tempted to join or otherwise assist Rebel forces. Making camp at Hare’s Corners near the Delaware River and along the road from Wilmington to New Castle, they fulfilled these duties until 6 June 1861 when they were shipped by the Northern Central and Cumberland Valley Railroads to south central Pennsylvania. Upon arrival at their next designated locale, they were attached to Major-General Robert Patterson’s Chambersburg, Pennsylvania command in early June as part of the 4th Brigade, 1st Division headed by U.S. Army Colonel Dixon S. Miles. Ordered to move again three days later, the 9th Pennsylvanians pitched their tents near Greencastle on 13 June 1864. 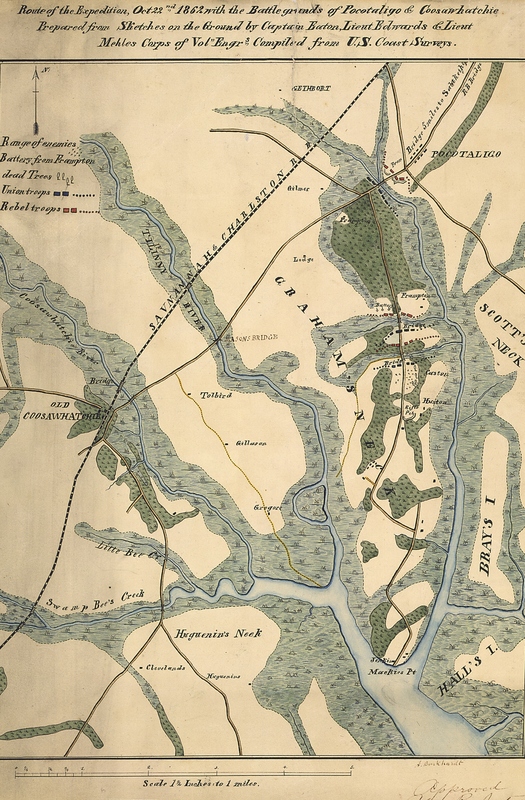 On 16 June, when ordered to march, they found themselves fording the Potomac River on the right of the 4th Brigade – literally wading chest deep at some points en route to their encampment between Williamsport and Martinsburg, Virginia. The next day, they were ordered back across the river where, still part of the 4th Brigade, they were now under the leadership of Brigade Commander, Colonel H. C. Longenecker and Division Commander, Major-General George Cadwalader. Stationed here through the end of the month, they were assigned to picket duty. Excerpt from larger montage of images of the Battle of Falling Waters, Virginia, 27 July 1861 edition of Harper’s Weekly. “Council of War” shows “Generals Williams, Cadwallader, Keim, Nagle, Wynkoop, and Colonels Thomas and Longnecker” strategizing on the eve of battle. Following the Union’s battle with Rebel troops at Falling Waters, Virginia, the men of the 9th Pennsylvania (having not fought in that engagement) were ordered to head for Martinsburg, Virginia, where they remained from 3-15 July when they broke camp and marched toward Bunker Hill. Although Major-General Patterson had initially planned to have his forces meet the Confederates head on at Bunker Hill and Winchester, officers directly under his command changed his mind during a Council of War on 9 July in Martinsburg. A confrontation there would be disastrous for the Union, they reasoned, because the enemy was not only heavily fortified and entrenched, it could be easily resupplied and strengthened as Rebel leaders brought in more troops via the Confederate-controlled railroad. History has proven those officers correct. 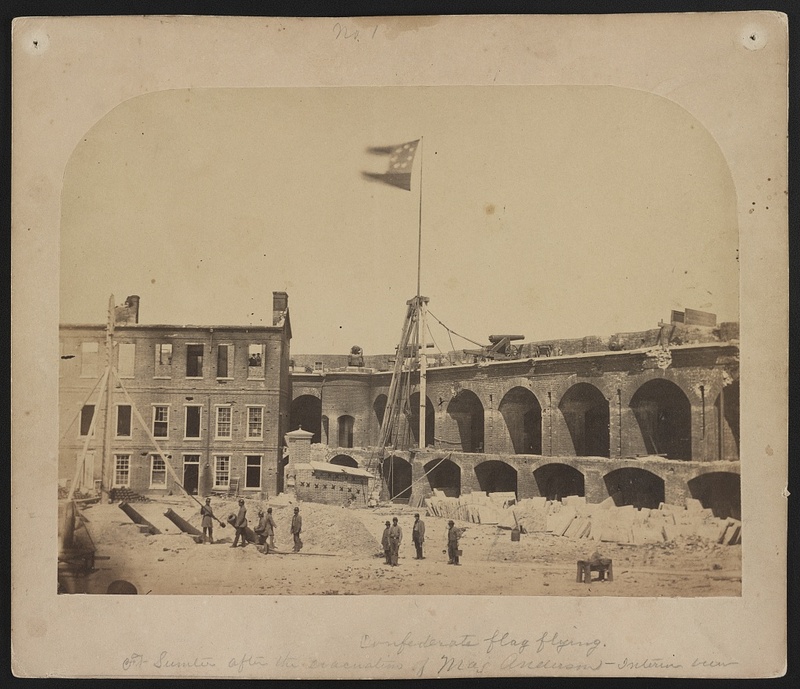 Having avoided a likely bloodbath, 1st Corporal Charles Nolf, Jr. and the 9th Pennsylvania encamped with the 4th Brigade near Charlestown from 17-21 July, and then headed for Harper’s Ferry. After crossing the Potomac into Maryland, the 9th made camp roughly a mile away. The next day, with not a single casualty among its ranks, Private Sylvester McCape and his fellow 9th Pennsylvanians headed home by way of Hagerstown and Harrisburg. Having completed his Three Months’ Service, Private McCape then honorably mustered out with his regiment at Camp Curtin on 29 July 1861. Barely settled back into his duties as a cobbler, Sylvester McCape re-enrolled for Civil War military service on 15 January 1862 at Allentown, Pennsylvania. Re-mustering for duty at Camp Curtin in Harrisburg, he became a Private with Company I, 47th Regiment, Pennsylvania Volunteer Infantry on 17 January 1862. Military records at the time described him as a shoemaker and resident of Allentown who was 5’6” tall with dark hair, gray eyes and a light complexion. The company which Private Sylvester McCape was joining – I Company – was already a seasoned one, having just participated with the 47th Pennsylvania Volunteers and other Union Army and Navy units in the captures of Saint John’s Bluff and Jacksonville, Florida in early October 1862 – and the capture of the Gov. Milton, a Confederate steamer which had been actively engaged in transporting and supplying Rebel troops up and down the coastal areas in and around the Saint John’s River. After completing his enlistment and training, Private McCape finally connected with his regiment from a recruiting depot on 13 October 1862 – just in time for the 47th Pennsylvania’s first major combat engagement. Union Army map of the Pocotaligo-Coosawhatchie Expedition, 21-23 October 1862 (public domain). From 21-23 October 1862, under the brigade and regimental commands of Colonel Tilghman H. Good and Lieutenant Colonel George W. Alexander, Private Sylvester McCape and his fellow 47th Pennsylvania Volunteers engaged Confederate forces in and around Pocotaligo, South Carolina. Landing at Mackey’s Point, the men of the 47th were placed on point. Although this assignment at point displayed the confidence of their leaders, it was an assignment which came with a high likelihood of injury or death. Harried by snipers en route to the Pocotaligo Bridge, Private McCape and his fellow 47th Pennsylvania Volunteers met resistance from an entrenched, heavily fortified Confederate battery which opened fire on the Union troops as they entered an open cotton field. 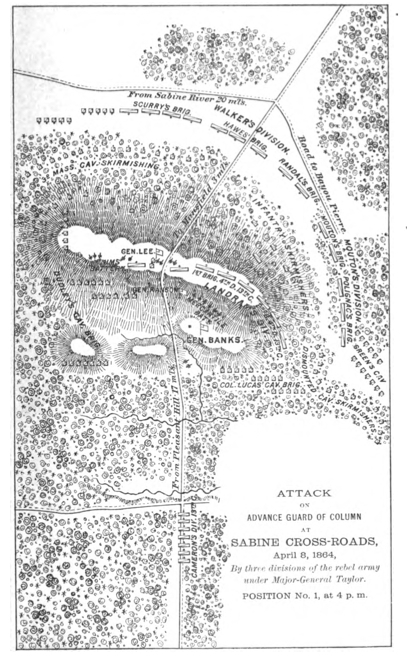 Those headed toward higher ground at the Frampton Plantation fared no better as they encountered artillery and infantry fire from the surrounding forests. Losses for the 47th were significant. Two officers and 18 enlisted men died, including I Company Privates L. Druckenmiller and Jeremiah Metz. Druckenmiller was killed by “Vulnus Sclopet” (a gunshot) during the fighting near the Frampton Plantation, according to his federal death ledger entry. Another two officers and 114 enlisted from the 47th were wounded, including I Company Privates J. Bondenschlager, James B. Cole, Edwin Dreisbach, Frederick Drester, Daniel Kramer. Dreisbach survived and continued to serve for the duration of the war while Privates Shaffer, Bondenschlager, Cole and Drester were discharged on Surgeons’ Certificates of Disability on 22 October, 29 October, 15 November and 22 December 1862, respectively. Several resting places of 47th Pennsylvania Volunteers still remain unidentified to this day, their burial data lost to the sloppy records of Army Quartermaster and hospital personnel, or to the trauma-impaired memories of soldiers who hastily interred or were forced to leave behind the bodies of comrades upon receiving orders to retreat. By 1863, Private Sylvester McCape and the other men of I Company were once based with the 47th Pennsylvania in Florida. 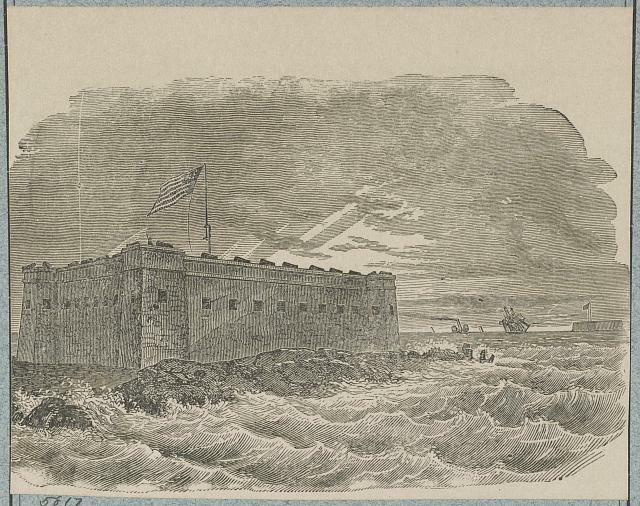 Having been ordered to Key West on 15 November of 1862, much of 1863 was spent guarding federal installations in Florida as part of the 10th Corps, Department of the South. Companies A, B, C, E, G, and I garrisoned Fort Taylor in Key West while Companies D, F, H, and K garrisoned Fort Jefferson in Florida’s Dry Tortugas. During this phase of duty, disease was a constant companion and foe. A significant number of men were felled by typhoid fever and other ailments for which their bodies were ill prepared. Others suffered from illnesses common to the often unsanitary conditions created by close camp living; many died or were discharged on Surgeons’ Certificates of Disability due to chronic dysentery and its related complications. Several even contracted scurvy. The time spent here by the men of Company I and their fellow Union soldiers was notable also for the men’s commitment to preserving the Union. Many who could have returned home chose instead to re-enlist in order to finish the fight. One who did not finish the fight was the head of Sylvester McCape’s company. Captain Coleman A. G. Keck of I Company resigned his commission on 22 February 1864 due to disability; he would be dead within two years, succumbing to the ravages of liver disease on 23 January 1866. Three days after Captain Keck’s resignation, Private McCape and the men of Company I and their fellow 47th Pennsylvania Volunteers set off on 25 February 1864 for a phase of service in which the regiment would truly make history. Steaming first for New Orleans via the Charles Thomas, the 47th arrived at Algiers, Louisiana on 28 February, and were then shipped by train to Brashear City. 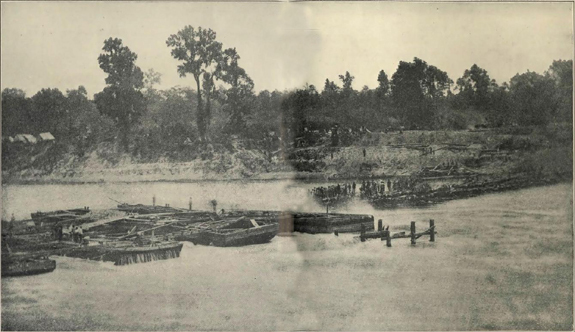 Following another steamer ride – to Franklin via the Bayou Teche – the 47th joined the 2nd Brigade, 1st Division of the Department of the Gulf’s 19th Army Corps. In short order, the 47th would become the only Pennsylvania regiment to serve in the Red River Campaign of Union General Nathaniel Banks. From 14-26 March, the men of Company I – now under the command of their 1st Lieutenant Levi Stuber – joined with their fellow 47th Pennsylvanians in trekking through New Iberia, Vermillionville, Opelousas, and Washington while en route to Alexandria and Natchitoches. Often short on food and water, the men encamped briefly at Pleasant Hill the night of 7 April before continuing on the next day, marching until mid-afternoon. Casualties were once again severe. Lieutenant Colonel Alexander was nearly killed, and the regiment’s two color-bearers, both from Company C, were also wounded while preventing the American flag from falling into enemy hands. Corporal William Frack of I Company was killed in action while I Company’s Sergeant William H. Halderman (alternate spelling “Haltiman”) and Corporal William H. Meyers of were among those who were wounded in battle. Still others from the 47th were captured, marched roughly 125 miles to Camp Ford, a Confederate Army prison camp near Tyler, Texas, and held there as prisoners of war (POWs) until released during a prisoner exchanges beginning 22 July 1864. At least two men from the 47th never made it out of that camp alive, including I Company’s Private Frederick Smith who died at Camp Ford 4 May 1864; another member of the regiment died while being treated at the Confederate Army hospital in Shreveport, Louisiana. Following what some historians have called a rout by Confederates at Pleasant Hill and others have labeled a technical victory for the Union or a draw for both sides, the 47th fell back to Grand Ecore, where the men resupplied and regrouped until 22 April. Retreating further to Alexandria, the 47th Pennsylvanian Volunteers and their fellow Union soldiers then scored a clear victory against the Confederates at Cane Hill. 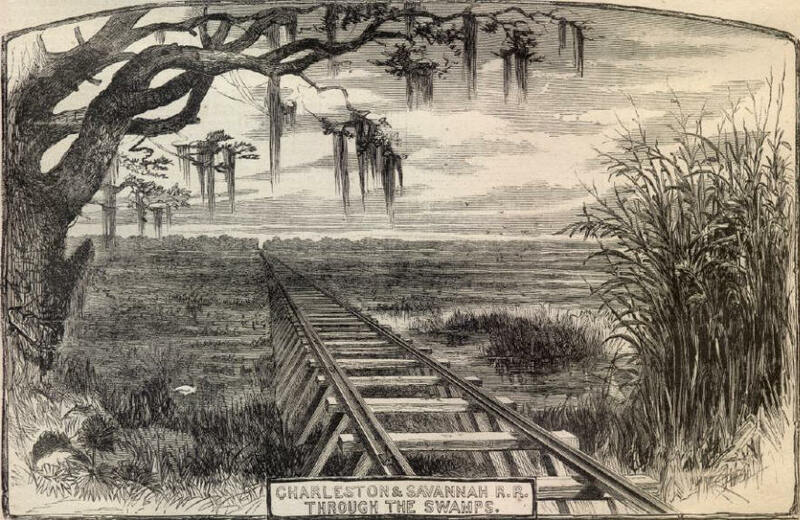 Beginning 16 May, I Company moved with most of the 47th from Simmsport across the Atchafalaya to Morganza, and then to New Orleans on 20 June. On the 4th of July that year, they learned their fight was far from over as the regiment received new orders to return to the East Coast for further duty. The next month – September 1864 – saw the regiment engaged in the Battle of Berryville, Virginia and the departure of several 47th Pennsylvania Volunteers who had served honorably, including the captains of D, E, F, and H companies, along with a number of officers and enlisted men from I Company. All mustered out 18 September 1864 upon expiration of their respective service terms. Those members of the 47th who remained on duty were about to engage in their regiment’s greatest moments of valor. Together with other regiments under the command of Union General Philip H. (“Little Phil”) Sheridan and Brigadier-General William H. Emory, commander of the 19th Corps, the members of Company I and their fellow 47th Pennsylvania Volunteers helped to inflict heavy casualties on Lieutenant General Jubal Early’s Confederate forces at Opequan (also spelled as “Opequon” and referred to as “Third Winchester”). 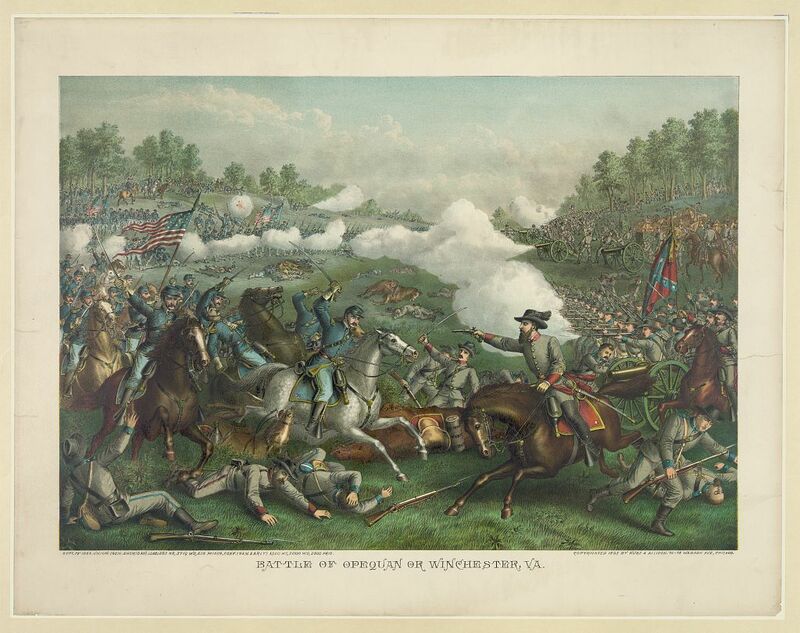 The battle is still considered by many historians to be one of the most important during Sheridan’s 1864 campaign; the Union’s victory here helped to ensure the reelection of President Abraham Lincoln. On the day of the Union’s success at Opequan (19 September 1864), several men from I Company received promotions, including 1st Sergeant Theodore Mink, who advanced to the rank of 2nd Lieutenant. Corporals William H. Meyers and Edwin Kemp were promoted to the rank of Sergeant while Privates Thomas N. Burke and Allen Knauss became corporals. After the battle, the 47th Pennsylvania Volunteers were sent out on skirmishing parties before making camp at Cedar Creek. Moving forward, they and other members of the 47th Pennsylvania Volunteers would continue to distinguish themselves in combat, but they would do so without two more of their respected commanders: Colonel Tilghman Good and Good’s second in command, Lieutenant Colonel George Alexander, who mustered out 23-24 September upon expiration of their respective terms of service. Fortunately, they were replaced by others equally admired both for temperament and their front line experience, including John Peter Shindel Gobin, a man who would later go on to become Lieutenant Governor of the Commonwealth of Pennsylvania. Once again, the casualties for the 47th were high. Sergeant William Pyers, the C Company man who had so gallantly rescued the flag at Pleasant Hill was cut down and later buried on the battlefield. Regimental Chaplain William Rodrock suffered a near miss as a bullet pierced his cap. A number of enlisted men from I Company were also killed or wounded in action. As with the Red River Campaign, men from the 47th Pennsylvania were also captured by Rebel soldiers and carted off to Confederate prisons at Andersonville, Georgia, Richmond, Virginia and Salisbury, North Carolina. Of those held as POWs at this time, only a handful survived. Among the unfortunates were I Company’s Private Henry J. Schlagle, who died at Salisbury three days after Christmas. Following these major engagements, the 47th was ordered to Camp Russell near Winchester, Virginia from November through most of December. On 3 November 1864, 2nd Lieutenant Theodore Mink was promoted to the rank of 1st Lieutenant. Rested and somewhat healed, the 47th was then ordered to outpost and railroad guarding duties at Camp Fairview in Charlestown, West Virginia five days before Christmas. Assigned first to the Provisional Division of the 2nd Brigade of the Army of the Shenandoah in February, the men of the 47th moved, via Winchester and Kernstown, back to Washington, D.C. Beginning 19 April, the 47th Pennsylvanians were again responsible for helping to defend the nation’s capital – this time following the assassination of President Abraham Lincoln. Encamped near Fort Stevens, they received new uniforms and were otherwise resupplied. An early thinning of the 47th Pennsylvania’s ranks began on 1 June 1865 when General Order No. 53 from the U.S. Office of the Adjutant General and U.S. Army’s Middle Military Division provided for the honorable discharge of several members of the regiment, including I Company’s Corporal Joseph Kramer, John J. Lawall, Jesse Moyer, Stephen Schechterly, Samuel Smith, Israel Troxell, D. Wannamaker, and Private Sylvester McCape. Following his honorable discharge from the military, Sylvester McCape returned home to Pennsylvania. On 5 March 1865, according to The Allentown Democrat, he wed Jemima C. Ruhf. A native of Salisbury Township, Lehigh County who was born on 1 October 1846, she was raised and resided in Allentown for much of her life, and was a daughter of Pennsylvania natives, Peter Ruhf and Emilie (Kruger) Ruhf. This wedding date may be in error, however, since certain records indicate that their only child – daughter Alice Amelia McCape – was born on 3 January 1865. What is known for certain is that, by 1870, Sylvester McCape and his wife, Jemima, were residing in Allentown’s 6th Ward with their five-year-old daughter, Alice. Here, at this place and time, he supported his wife and daughter through employment as a laborer at a local furnace. Jemima McCape also became, during this decade or the next, an active member of the ladies’ auxiliary which supported her local Grand Army of the Republic (G.A.R.) post. By 1900, Sylvester and Jemima McCape were living on their own in Allentown, where Sylvester continued is employment in shoe repair. Their daughter, Alice, had taken the married surname of Delp (alternate spelling “Delph”), and had begun housekeeping with her husband in their own home. The will of John Bahnhoff the retired rag peddler, who met his death in a plunge from a second story window last week, was probated yesterday [6 February 1911]. He directs that all his household goods, furniture, clothing, etc. together with $100 in cash be given to Mrs. Mamie Leiby. This is a token of appreciation for kindnesses shown the testator during his stay in her house. The executor, William J. Egge, Jr., is directed to make suitable funeral arrangements, the cost of which is not to exceed $100. $25 is to be given o Sylvester McCape for services rendered. The balance of the personal property, together with all cash in bank and money from life insurance policies is bequeathed to Miss Emma Clemens of Reedsville, Mifflin County, this state. The will was made on July 24, 1909 and was witnessed by T. E. Miller and Sylvester McCape. Fifty years ago yesterday Mr. and Mrs. Sylvester McCabe [sic], 516 North Eighth St., were married and the celebration of the golden wedding anniversary was quietly held at their home Thursday. Mr. McCabe [sic] celebrated his seventieth birthday anniversary and last evening the members of the Allen Circle, No. 10, Ladies of the G.A.R., of which Mrs. McCabe [sic] is one of the oldest members, surprised the couple at their home. The members of the G.A.R. did not know that Mr. McCabe’s [sic] birthday was Thursday and this feature was in turn a surprise to them. However, the couple was not expecting any festivities last night and the surprise was complete. The evening was very pleasantly spent with selections on the Victrola, the exchanging of reminiscences and fine refreshments were served. The couple are very well preserved and are full of vitality. None of those present last evening enjoyed the event more thoroughly than they did. Mr. McCabe [sic] served his first enlistment, three month, in Company D, Ninth Regiment, Pennsylvania Volunteers, being a member of the third company to leave Allentown. Later he served three more years. Before her marriage, Mrs. McCabe [sic] was Jemima Ruhf. She was born in Salisbury township and reared in this city, and resided her all her life. Suffering from Angina Pectoris, Sylvester McCape succumbed to the disease’s effects at his home at 5:30 a.m. on the morning of 17 October 1918. He was 76 years, 8 months and 12 days old. His widow, Jemima, served as the informant on his death certificate. Sylvester McCape, 76 years old, 516 N. Eighth St., died yesterday at his home from complications. Mr. McCape was born in Ireland March 5th, 1842, and when ten years old came to this country with his parents. He was a Civil War veteran and served two engagements. He was a member of the 9th Regiment, Pa. Vol., and after being mustered out re-enlisted in Co. I, 47th Vol., and served throughout the war. After the war Mr. McCape learned the shoe business and continued in that business until about a year ago, when he retired. He was a member of Salem Reformed church and 47th Regiment Asso., and he is also a member of Post 13 G.A.R. He is survived by his widow, Jemima (nee Ruhf) and four grandchildren. Mrs. Alice Delph, his daughter, died some years ago. Interment in Union cemetery. Beautiful floral offerings were received by the family of Sylvester McCape, whose funeral took place last Thursday [17 October 1918]. Following is a list: Sheaf of wheat, wife; sheaf of wheat, Distil family; chrysanthemums, Mrs. Mohr; carnations, Mrs. Fogel, Lillie and Clinton; chrysanthemums, grandchildren; slumber robe, Samuel I. Glasser and family. The family wishes to express their appreciation for the thoughtful attention shown them suring their bereavement by friends and relatives. His widow, Jemima (Ruhf) McCape, who would also suffer from heart disease later in her own life, joined him in death on 9 July 1937, passing away at the McCape family home in Allentown. She was also interred at the Union-West End Cemetery. Her grandson, Paul Delp (son of Jemima’s late daughter, Alice), served as the informant on Jemima’s death certificate. 2. Card of Appreciation, in The Allentown Democrat. Allentown: 23 October 1918. 3. Celebrate Their Golden Wedding Anniversary, in The Allentown Democrat. Allentown: 6 March 1915. 4. Civil War Muster Rolls and Related Records (Record Group 19, Series 19.11), in Records of the Department of Military and Veterans’ Affairs. Harrisburg: Pennsylvania Historical and Museum Commission. 5. Civil War Veterans’ Card File. Harrisburg: Pennsylvania State Archives. 6. Civil War Veteran Answers Last Call, in The Allentown Democrat. Allentown: 18 October 1918. 7. Death Certificates (Sylvester McCape and Jemima Ruhf McCape). Harrisburg Commonwealth of Pennsylvania: Department of Health, Bureau of Vital Statistics. 8. June Jury Panels: Men to Sit at the Next Criminal Court Are Chosen: Petit Jury for June 6, in The Allentown Leader. Allentown: 7 May 1898. 9. Kindness Rewarded: Will of John Bahnhoff, Provides for Those Who Befriended Him, in The Allentown Democrat. Allentown: 7 February 1911. 10. McCape [funeral notice], in The Allentown Democrat. Allentown: 18 October and 21 October 1918. 12. Sylvester McCape (burial record), in Historic Pennsylvania Church and Town Records. Philadelphia: Historical Society of Pennsylvania, 1918. 13. U.S. Census and U.S. Veterans’ Schedule. 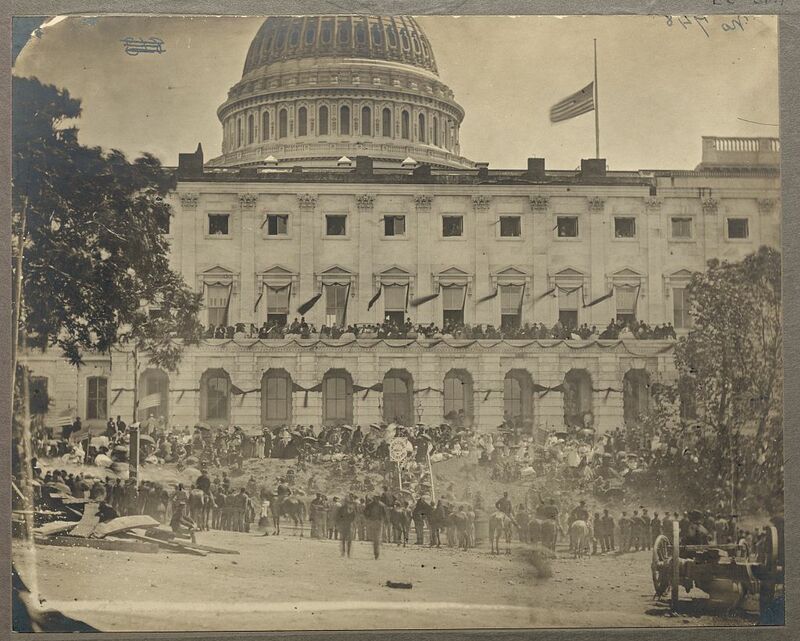 Washington, D.C. and Pennsylvania: 1850-1920.